Clarification of the designs: HOLLY SPRIG, HOLLY SPRIG VT. and HOLLY WHIRL each have their unique qualities. The center portion of Holly Whirl has no design, creating a circular effect of the Holly. Holly Sprig offers overlapping leaves in the center. Holly Sprig Vt. is rarely seen, but has a “multi-ringed star” in center. 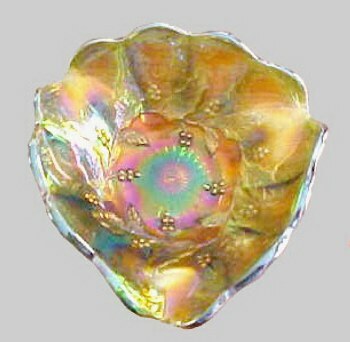 Amethyst, green and marigold are the basic colors found in the three designs. ISAAC BENESCH around the circumference of marie. & SONS - 54th Anniversary. HOLLY SPRIG Banana Boat in Amethyst. HOLLY SPRIG: Some bonbons are quite deep, others are more the card tray shape seen in these two examples. 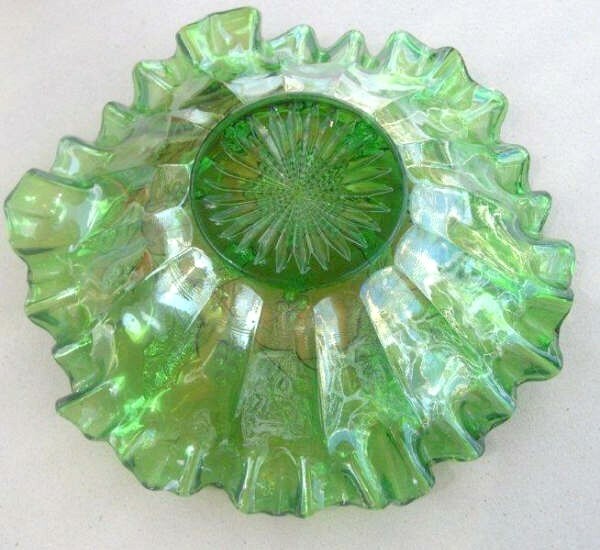 There also are known green bonbons in this pattern, as well as a lavender shade of the amethyst example. 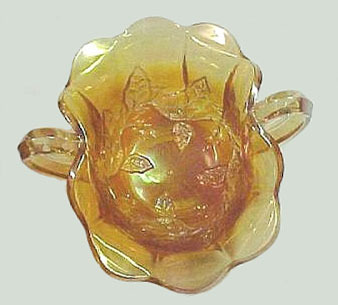 Occasionally, a marigold card tray shape is found having advertising within the marie. “The Great House of Isaac Benesch and Sons encircles the rim. In the center of the marie: 54th Anniversary. Based on their long years of business, this would place production in the 1912 timeframe. It stands to reason that fewer of these anniversary issues would be available, since they were intended for premiums during the course of only one year. Without question, Millersburg produced these bonbons. Further study of the bowls can be found in Advertising Carnival – Part 1. 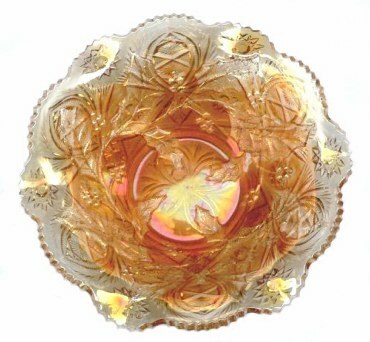 The more available amethyst ruffled sauce dishes which advertise this same furniture business were the customary “premiums” given with sales. (An example of this sauce can be seen by clicking on ~ ~ in the pattern alphabet on our homepage.) Whether Fenton or Millersburg produced these small sauces has always been in question. In his great book surrounding the advertising spectrum, John Resnik proclaims them to come from Fenton production. 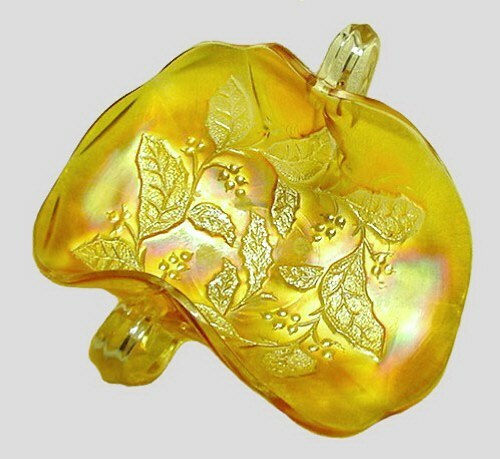 John’s book offers none of the exterior examples of advertising, such as this Holly Sprig bonbon offers. Left: - 5 in. 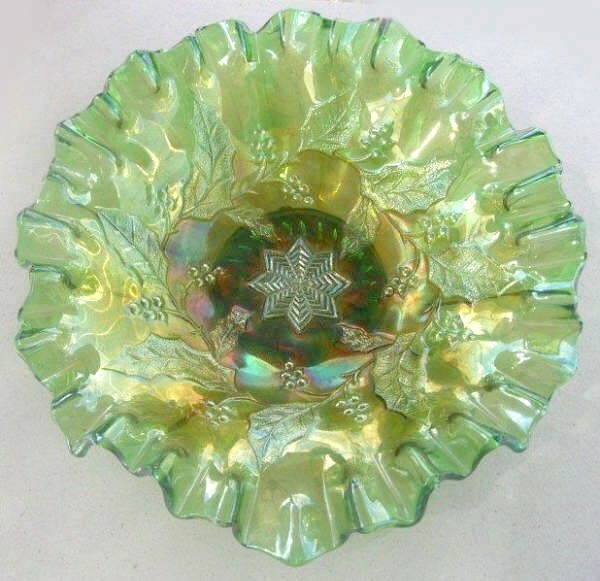 Square HOLLY WHIRL CRE Bowl. $450. 3 - 07 Wroda Auction. Right: - HOLLY WHIRL - 9 inch - Amethyst. 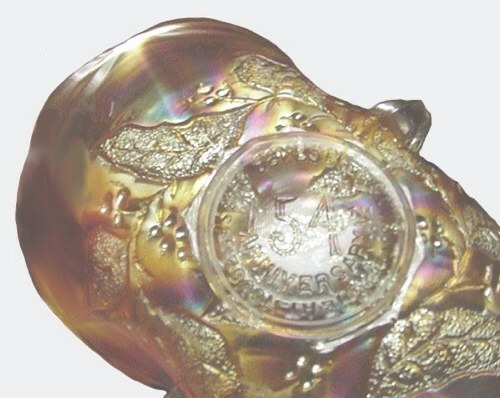 $525. in 3 - 07 Wroda Auction. Right: - HOLLY WHIRL Bonbon - Marigold. Left: - HOLLY WHIRL with tight crimp - Green. Right: - HOLLY WHIRL tri-corner Nappy in Mgld. 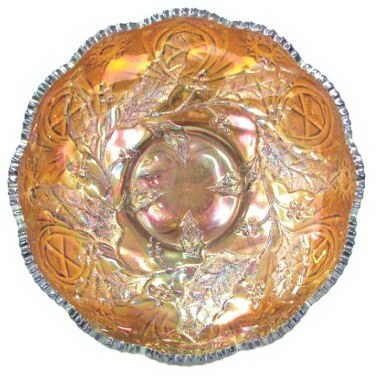 HOLLY WHIRL Round Bowl-Purple - 7.75 in. diam. Left: - HOLLY WHIRL Tri-Corner in Green. 7 in. x 2.75 inch. 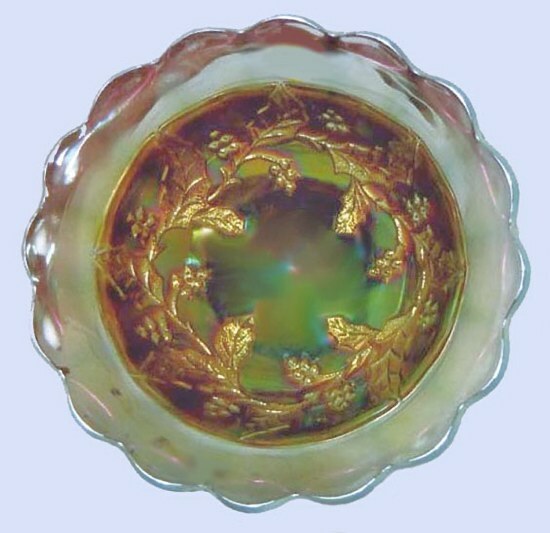 Right: - HOLLY WHIRL - NEAR CUT Wreath Exterior, 9.5 in. diameter. 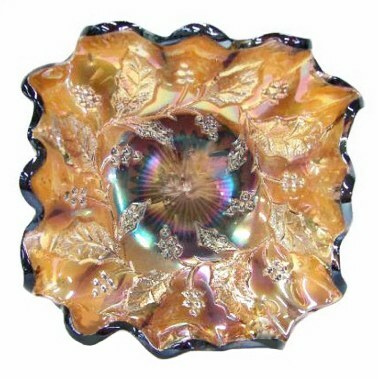 HOLLY WHIRL: 6” to 10” bowls in the Holly Whirl pattern typically have the Wide Panel exterior . 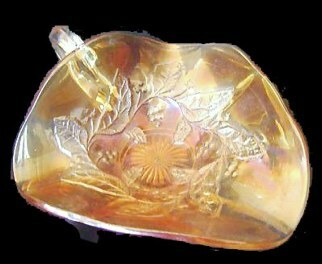 Square or tri-cornered bowls are rarely available, and this ice cream shape is somewhat unusual as well. 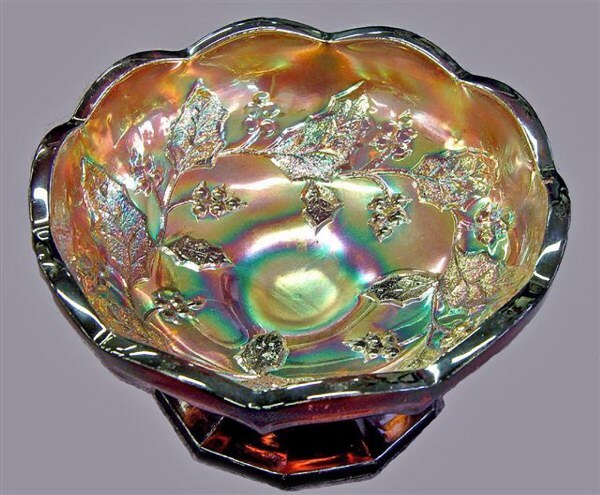 Most bowls are ruffled, but deep round ice cream shape, square with crimped edge, and bowls with a tight crimp are known, as well. 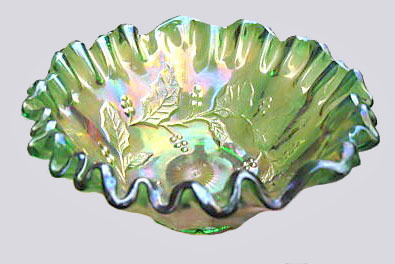 Some of the larger ruffled bowls offer a tooth edge. Colors are amethyst, green and marigold. 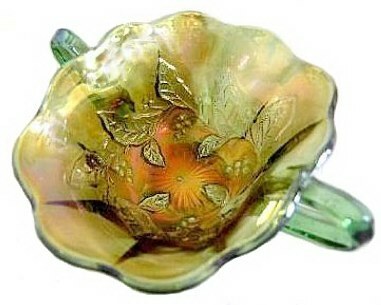 There is a rose bowl whimsey in vaseline. The nappies are usually tri-corner in shape. 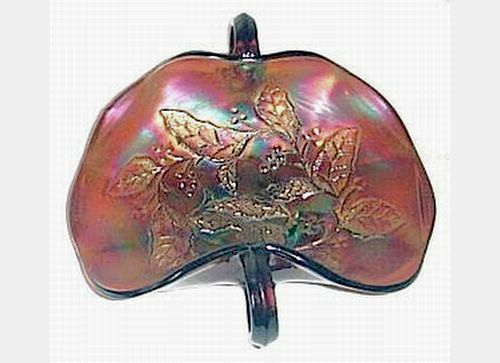 The short-stemmed compote in amethyst is very scarce. Some examples are ice cream shaped, while others are crimped.